The golden fillet (金箍圈, jingu quan) is one of the Monkey King’s most recognizable iconographic elements appearing in visual media based on the great Chinese classic Journey to the West (1592). It is generally portrayed as a ringlet of gold with blunt ends that meet in the middle of the forehead and curl upwards like scowling eyebrows (type one) (fig. 1). A different version is a single band adorned with an upturned crescent shape in the center (type two) (fig. 2). Another still is a simple band devoid of decoration (type three) (fig. 3). Sun first earns the headband as punishment for killing six thieves shortly after being released from his five hundred-year-long imprisonment. The circlet is a heaven-sent magic treasure designed to reign in the immortal’s unruly, rebellious nature. Since Sun Wukong is a personification of the Buddhist concept of the “Monkey of the Mind” (心猿, xinyuan,), or the disquieted mind that bars humanity from enlightenment, the fillet serves as a not so subtle reminder of Buddhist restraint. Few scholars have attempted to analyze the treasure’s history. In this paper I present textual and visual evidence from India, China, and Japan that suggests it is ultimately based on a ritual headband worn by Esoteric Buddhist Yogin ascetics in 8th-century India. I also show how such fillets became the emblem of some weapon-bearing protector deities in China, as well as military monks in Chinese opera. The headband is first mentioned in chapter eight when three such “tightening fillets” are given to the Bodhisattva Guanyin by the Buddha in order to conquer any demons that she may come across while searching for a monk who will bring sutras back to China from India. The “Enlightened One” explains their purpose: “If [the monster] is disobedient, this fillet may be put on his head, and it will strike root the moment it comes into contact with the flesh. Recite the particular spell which belongs to the fillet and it will cause the head to swell and ache so painfully that he will think his brains are bursting. That will persuade him to come within our fold” (Wu & Yu, 2012 (Vol. 1), pp. 206-207). He notes that there are different spells for each piece, including “the Golden, the Constrictive, and the Prohibitive Spell” (Wu & Yu, 2012 (Vol. 1), p. 206). Monkey is forced to wear the fillet until he attains Buddhahood in chapter one hundred, causing it to vanish (Wu & Yu, 2012 (Vol. 4), p. 383). The band’s disappearance at the end of the novel denotes Sun’s internalization of self-control. But the treasure doesn’t disappear forever. It appears once more in the Later Journey to the West (後西游記, Hou Xiyouji, 17th-cent. ), a sequel set 200 years after the original. The story follows a similar trajectory with Monkey’s descendant Sun Luzhen (孫履真, “Monkey who Walks Reality”) attaining immortality and causing havoc in heaven. But this time the macaque Buddha is called in to quell the demon. Monkey quickly disarms the “Small Sage Equaling Heaven” of his iron staff and pacifies him not with trickery but with an enlightening Buddhist koan. He then places the band on Luzhen’s head to teach him restraint (see Liu, 1994). Fig. 1 – (Left) A type one fillet from the comedy A Chinese Odyssey 2 (1995). Fig. 2 – (Center) A type two fillet from the 1986 TV show. Fig. 3 – (Right) A type three fillet from an 11th-century painting in Eastern Thousand Buddha Cave number two in Gansu Province, China. It appears very few scholars writing in English have attempted to trace the origins of the golden fillet. Wang Tuancheng theorizes that the idea for the headband came from two sources. First, the historical journal of Xuanzang (602-664 CE), the Tang Dynasty monk on whom Tripitaka is loosely based, details how he was challenged to a religious debate by a man in a foreign kingdom who offered his own head as the price of defeat. Xuanzang won, but instead of collecting his prize, the monk took the man as his servant. Second, Wang notes that slaves during the Han Dynasty (206 BCE-220 CE) wore a metal collar around their neck shaped like the Chinese character for twenty (廿, nian). He goes on to explain: “…the author transformed the metal hoop that the non-Buddhist might have worn to Sun Wukong’s headband” (Wang, 2006, p. 67). I’m not particularly persuaded by this argument since Wang doesn’t offer any evidence as to why a Han-era slave implement would still be in use during the Tang (618-907 CE) four to five hundred years later; nor does he suggest a reason for why such a collar would be moved from the neck to the head. Besides, there exists religious art featuring the fillet (see below) that predates the novel by some three centuries, meaning it wasn’t the sole invention of the author/compiler of the novel. Before I continue, I would like to point out that the 13th-century precursor of the novel, The Story of Tripitaka of the Great Tang Procures the Scriptures, does not mention the fillet at all (this is just one of many differences between it and the final 16th-century version). Monkey is simply portrayed as a concerned individual who purposely seeks out Tripitaka to ensure his safety, as the monk’s two previous incarnations have perished on the journey to India. In other words, he comes as a willing participant, which negates the need for positive punishment via the ringlet. But at least two works coinciding with the Song Dynasty (960-1279) depict Monkey wearing a band, which, again, excludes the treasure being a later invention. Identical earrings (these are key iconographic features of H[anuman] in many Southeast Asian R[ama saga]s), comparable tilt of the head… which seems to indicate enforced submission, long locks of hair… flaring out behind the head, elongated monkey’s mouth, similar decorations on the forearm and upper arm, etc. It is crucial to note that all these features can be found in South Asian and Southeast Asian representations of H[anuman]. (Walker, 1998, p. 70). So as it stands, the 13th-century appears to be the furthest that the motif has been reliably traced. Fig. 4 (Left) – The 13th-century stone relief of Sun Wukong from the Kaiyuan Temple in Quanzhou, Fujian province, China (larger version). Fig. 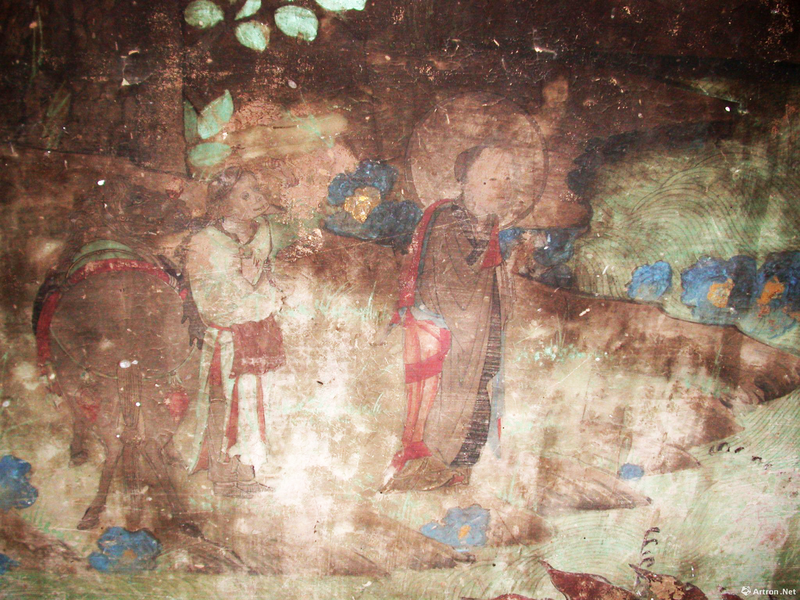 5 – (Center) A portion of the 11th-century painting in the Eastern Thousand Buddha Cave number two (larger version). Fig. 6 – (Right) The 12th-century Japanese painting “Aka-Fudo” (赤不動) (larger version). A mixture of Chinese-style and Vajrayana traditions and imagery was employed in the Tangut Xixia Kingdom … which was based in Ningxia, Gansu, and parts of Shanxi … It is difficult to imagine that this “new” type of Buddhism, which not only was flourishing in Tibet in the late tenth century but was also found in the neighboring Xixia Kingdom and may have been practiced by Tibetans based in the Hexi Corridor region of Gansu Province, was completely unknown in central China until the advent of the Mongols (p. 19). The yogin must wear the sacred ear-rings, and the circlet on his head; on his wrists the bracelets, and the girdle round his waist, rings around his ankles, bangles round his arms; he wears the bone-necklace and for his dress a tiger-skin… (Linrothe, 1999, p. 250). Aksobhya is symbolized by the circlet, Amitabha by the ear-rings, Ratnesa by the necklace, and Vairocana (by the rings) upon the wrists. Amogha is symbolized by the girdle. Wisdom by the khatvanga [staff] and Means by the drum, while the yogin represents the Wrathful One himself [Heruka]. Song symbolizes mantra, dance symbolizes meditation, and so singing and dancing the yogin always acts (Linrothe, 1999, p. 251). As can be seen, the circlet represents Aksobhya (Sk: “Immovable”; Ch: 阿閦如来, Achurulai). This deity is known for his adamantine vow to attain buddhahood through the practice of Sila, or “morality”, the aim of which “is to restrain nonvirtuous deeds of body and speech, often in conjunction with the keeping of precepts” (Buswell & Lopez, 2013, pp. 27 and 821). So the ritual band most likely served as a physical reminder of right speech and action, making it the best candidate for the origin of Monkey’s fillet. Sun is after all the representation of the “Monkey of the Mind” (as noted in the introduction), so his inclusion in the Eastern Thousand Buddha Cave painting was probably meant to convey the taming of this Buddhist concept via the circlet (apart from referencing the popular tale itself). The Hevajra Tantra, the text in which the circlet appears, was first translated into Tibetan by Drogmi (993-1074) and adopted during the 11th-century as a central text by the respective founders of the Kagyu and Sakya sects, two of the six major schools of Tibetan Buddhism. Various members of the Sakya sect were invited by Mongol royalty to initiate them into the text’s esoteric teachings during the 13th-century. These include Sakya Pandita and his nephew Chogyal Phagpa, who respectively tutored Genghis Khan’s grandson Prince Goden in 1244 and Kublai Khan in 1253. The meeting between Kublai and Chogyal resulted in Vajrayana Buddhism becoming the state religion of Mongolia. The Hevajra Tantra was translated into Chinese by the Indian monk Dharmapala (963-1058 CE) in 1055 during the Northern Song Dynasty (960-1127). The text, however, did not become popular within the Chinese Buddhist community like it would with the Mongols in the 13th-century (Bangdel & Huntington, 2003, p. 455). But this evidence shows how the concept of the 8th-century ritual circlet could have traveled from India to East Asia to influence depictions of Sun Wukong in the 11th-century. And the relatively unknown status of the text in China might ultimately explain why there are so very few depictions of Chinese deities wearing the fillet, or why it does not appear in the 13th-century version of Journey to the West. While the Xixia painting (fig. 5) lacks many of the ritual adornments (apart from the fillet) mentioned in the Hevajra Tantra, the Quanzhou stone relief (fig. 3) includes the band, earrings, necklace, bangles, and possibly even a tiger skin apron, suggesting it too has an esoteric origin (most likely based on Chinese source material). The band’s connection to esoteric Buddhism is further strengthened by a 12th-century painting from Japan. Titled Aka-Fudo (赤不動), or “Red Fudo [Myoo]”, it depicts the wrathful esoteric god seated in a kingly fashion, holding a fiery, serpent-wrapped Vajra sword in one hand and a lasso in the other (fig. 6). He wears a golden, three-linked headband (similar to the curls of type one), which stands out against his deep red body and flaming aureola. Biswas (2010) notes: “…the headband on his forehead … indicate[s], according to some, a relation to the habit of groups of ascetics who were among the strong supporters of Acalanatha” (112). His supporters were no doubt yogin practitioners in the same vein as those who worshipped Heraku and other such wrathful protector deities. Fig. 7 – (Left) Huang Ji’s “Sharpening a Sword” (early 15th-century) (larger version). Fig. 8 – (Center) Example of a jiegu (戒箍) fillet from a TV show. Fig. 9 – (Right) A late Ming woodblock of the warrior monk Lu Zhishen with a crescent staff (larger version). It’s important to note that Monkey was not the only cultural hero of the Ming Dynasty (1368-1644) to wear a golden fillet. Another example is Li Tieguai (李鐵拐), or “Iron Crutch Li”, the oldest of the Eight Immortals. 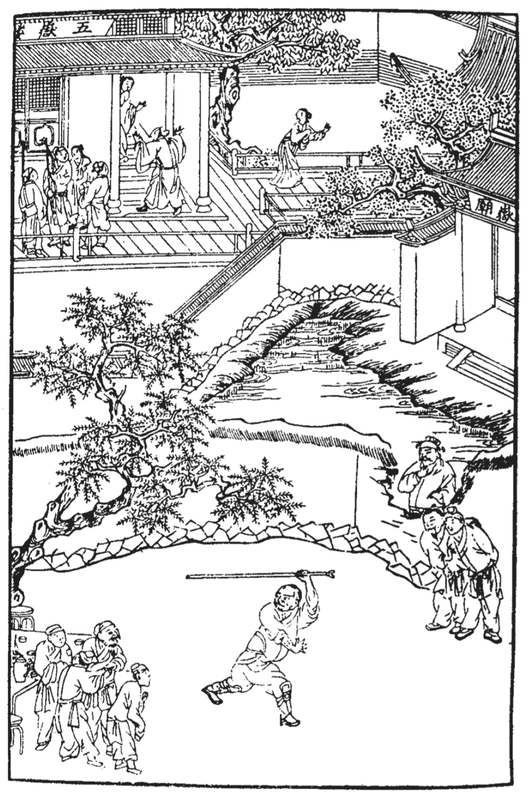 Li is generally portrayed as a crippled beggar leaning on a cane. Legend has it that his original body was cremated prematurely by a disciple while the immortal traveled in spirit to answer a summons from Lord Laozi, the high god of Daoism. Li’s spirit returned a day later to find only ashes, thus forcing him to inhabit the body of a recently deceased cripple. According to Allen and Philips (2012), “Laozi gave him in recompense a golden headband and the crutch that was to become his symbol” (p. 108). Some depictions of Li wearing the fillet predate Journey to the West. The most striking example is Huang Ji’s Sharpening a Sword (early 15th-century) (Fig. 7), which portrays the immortal wearing a type three band and sharpening a double-edged blade on a stone while staring menacingly at the viewer. One theory suggests Li’s martial visage identifies him as a “spirit-guardian of the [Ming] state” (Little, 2000, p. 333). Both Monkey and Li are therefore portrayed as brutish, weapon-bearing, golden headband-wearing immortals who serve as protectors. This shows the fillet was associated with certain warrior deities during the Ming. The fillet’s connection to religion and martial attributes culminated in the Jiegu (戒箍, “ring to forget desires”), a type two band worn by Military Monks (武僧, Wuseng) in Chinese opera to show that they have taken a vow of abstinence (fig. 8). Such monks are depicted as wearing a Jiegu over long hair (Bonds, 2008, pp. 177-178 and 328), which contrasts with the bald heads of religious monks. I would like to suggest the band’s half-moon shape may have some connection to a Ming-era woodblock print motif in which martial monks are shown wielding staves tipped with a crescent (fig. 9). The exact reason for the shape is still unknown (Shahar, 2008, pp. 97-98), but the association between the crescent and martial monks seems obvious. The use of the fillet in Chinese opera led to it being worn by Sun Wukong in the highly popular 1986 live-action tv show adaptation of the novel (fig. 2). 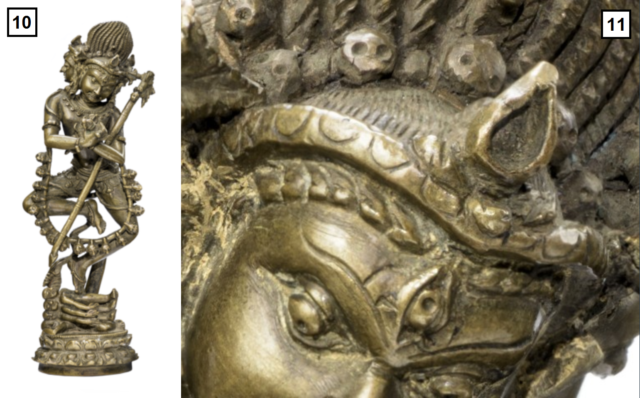 Examples of past research into the origins of the golden fillet respectively point to a slave collar from the Han dynasty (206 BCE-220 CE) and circa 13th-century South and Southeast asian depictions of the Buddhist guardian Andira and the Hindu monkey god Hanuman as possible precursors. However, the first isn’t credible, and the second, while on the right track, doesn’t go back far enough. An 11th-century painting in the Eastern Thousand Buddha Cave complex depicts Sun Wukong wearing a type three fillet with possible ties to a ritual circlet worn by Esoteric Buddhist Yogin ascetics in 8th-century India. The Hevajra Tantra, the esoteric text that mentions the band, associates it with the Aksobhya Buddha and thereby his moralistic, self-restraining practices. The text was transmitted from india to Tibet, China, and Mongolia from the 11th to the 13th-centuries, showing a clear path for such imagery to appear in East Asia. A 12th-century Japanese Buddhist painting of the guardian deity Fudo Myoo with a fillet suggests the practice of wearing circlets in esoteric rituals continued for centuries. Other non-Buddhist deities became associated with the fillet during the Ming Dynasty. A 15th-century painting of the immortal Li Tieguai, for example, depicts him as a type one circlet-wearing, sword-wielding guardian of the Ming dynasty. All of this suggests the band became a symbol of weapon-bearing protector deities. The association between the fillet and religion and martial attributes led to its use as the symbol of military monks in Chinese opera. Fig. 10 – The Buddhist Deity Hevajra, late 11th to early 12th-century, copper alloy (larger version). Courtesy of the Los Angeles County Museum of Art. Fig. 11 – Detail of the circlet. He wields the vajra in the right hand and from his left shoulder hangs the Khatvanga [staff] with a flowing banner, like a sacred thread. He carries in his left hand the kapala [skull cap] full of blood. His necklace is beautified by a chain of half-a-hundred severed heads. His face is slightly distorted with bare fangs and blood-shot eyes. His brown hair rises upwards and forms into a crown which bears the effigy of Aksobhya. He wears a kundala [ear decoration] and is decked in ornaments of bones. His head is beautified by five skulls (Donaldson, 2001, p. 221). Our statue has many of these features but lacks the image of the Buddha in his hair. This suggests the knob visible in the coif (fig. 10) once carried such a figure. So once again we see the importance of the Aksobhya Buddha. The statue is similar to 10th and 11th-century stone statues from India. While this doesn’t get us any closer to what the original circlet looked like, this statue adds to the mutability of the fillet imagery. The Hevajra Tantra is vague in its description, and so it is no surprise that so many variations have appeared over the centuries. The original sanskrit text uses the word cakri (circle) to refer to the band (Farrow & Menon, 2001, pp. 61-62). This might explain the simple type three fillet worn by Monkey in the Eastern Thousand Buddha Cave two painting (fig. 2). 1) The type of band that is given to particular characters is explained in Wu & Yu, 2012 (Vol. 2), p. 251. 2) For the entire episode, see Wu & Yu, 2012 (Vol. 1), pp. 314-320. 3) The child first speaks his new name in Wu & Yu, 2012 (Vol. 2), p. 354. The name Sudhana originates from the Avatamsaka Sutra (Wu & Yu, 2012 (Vol. 2), pp. 386-387 n. 3). 4) For a complete English translation, see Wivell (1994). 5) This is just one of many relief carvings that grace the pagoda. It includes other guardian-type figures with esoteric elements but rendered in the Chinese style. See Ecke and Demiéville (1935). 6) The Eight Immortals are Daoist saints who came to be worshipped as a group starting sometime in the Jin Dynasty (1115-1234) (Little 2000: 319). 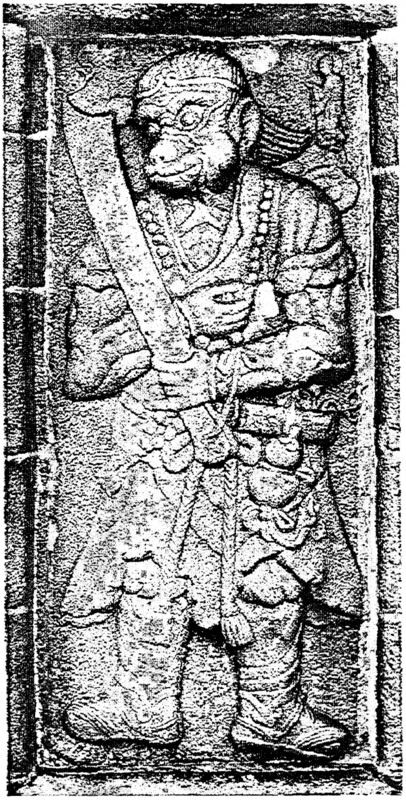 7) The sword is usually a symbol of the immortal Lu Dongbin, but, as noted above, it is used to identify Li Tieguai as a Ming guardian (Little 2000: 333). 8) Shahar (2008) discusses the historical differences between religious and military monks in ancient China. 9) The actor who played Monkey, Liu Xiao Ling Tong (Born Zhang Jinlai 章金萊, 1959), comes from a family who has specialized in playing Sun Wukong in Chinese opera for generations (Ye, 2016). 10) See the Heruka chapter in Linrothe (1999). He includes our statue in his study, but other sources describe it as Tibetan instead of India (Bangdel & Huntington, 2003, p. 458). Allan, T., & Phillips, C. (2012). Ancient China’s myths and beliefs. New York: Rosen Pub. Bangdel, D., & Huntington, J. C. (2003). The Circle of Bliss: Buddhist Meditational Art. Chicago, Ill: Serindia Publications. Biswas, S. (2010). Indian influence on the art of Japan. New Delhi: Northern Book Centre. Donaldson, T. E. (2001). Iconography of the Buddhist sculpture of Orissa. New Delhi: Indira Gandhi National Centre for the Arts. Little, S. (2000). Taoism and the arts of China. Chicago, IL: Art Institute of Chicago. Metropolitan Museum of Art (New York, N.Y.), Leidy, D. P., Strahan, D. K., & Becker, L. (2010). Wisdom embodied: Chinese Buddhist and Daoist sculpture in the Metropolitan Museum of Art. New York: Metropolitan Museum of Art. Wang, T. (2006). Dust in the wind: Retracing Dharma Master Xuanzang’s Western pilgrimage. Taipei: Rhythms Monthly. Wu, C., & Yu, A. C. (2012). The journey to the West (Vol. 1-4) Chicago, Ill: University of Chicago Press.